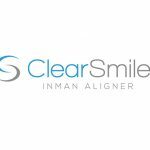 My experience with orthodontics, like so many other practitioners, started with the ClearSmile Inman Aligner. I achieved good results, but as the appliance was only applicable for simple cases I wanted to branch out and take the next step. I moved into exploring fixed orthodontics with another brand, but decided to come back to the IAS Academy after I was unhappy with the support I received, adopting the ClearSmile Brace on completion of their conversion course. Fixed braces aren’t for everyone so I completed the ClearSmile Aligner course and commenced my first case in 2016, which is detailed below. A long-standing patient presented who I had been providing routine dental care to since 2011. 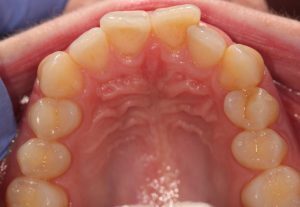 The patient had excellent oral hygiene but treatement was needed to address overcrowding in the lower arch and Class II relationships. A full orthodontic assessment was performed (Table 1) and the treatment aims and compromises were discussed with the patient in detail (Table 2). Archwize™ software was used to evaluate the final tooth positions and calculate the estimated interproximal reduction (IPR) needed to achieve the ideal tooth positions. 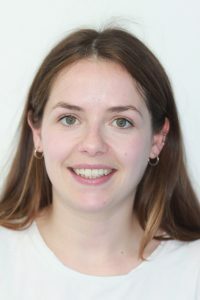 Photos were taken to post on the IAS forum for feedback on the case and the mentors suggested that a degree of buccal flaring/ premolar expansion would improve aesthetics due to a wide buccal corridor – this would also lessen the amount of necessary IPR in the lower arch. The patient consented to this and treatment commenced. August’16 Sent impressions to lab for first set of upper and lower aligners. August’16 Tried in both upper and lower aligners but they did not seat properly so unwilling to carry out IPR. Consulted the forum for advice. September’16 Forum reassured that aligners would seat once teeth loosen. Performed IPR as per guide. Contacts smoothed and patient used fluoride mouthwash. 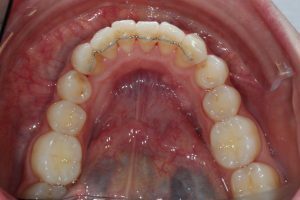 Presented patient with first four upper and lower aligners and care instructions. 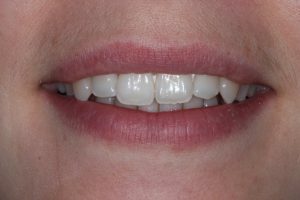 October’16 Patient fitted fourth aligners on upper and lower. Patient reported that first aligner took two weeks to seat properly and was uncomfortable, but this eased over time. 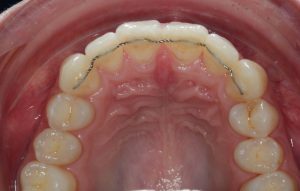 The lower aligner also eased due to discomfort caused by LL4 against the tongue. Photos taken. Patient revealed that she was now pregnant – assured her that as long as she maintains excellent oral hygiene treatment can continue. November’16 IPR performed and fluoride mouthwash given. Fitted upper and lower aligner 5. 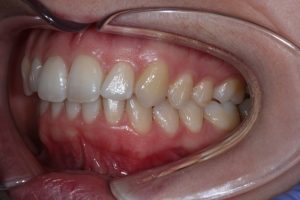 Patient given aligner 6. December’16 Some pericorinitis identified on LL8. Silicone impressions for next aligners and photos taken. January’17 Tried in upper and lower aligner 7. Upper almost seats but lower springs out of place. IPR performed, smoothed contacts and rinsed with Fluoride mouthwash. Advised that once aligners are fully seated to wear for a week before changing to the next in the series. 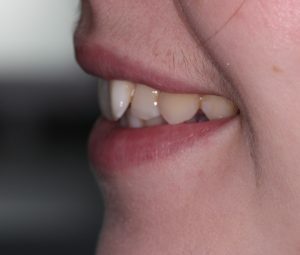 Patient given aligners 7 – 12. Patient to return for review once wearing aligner 10. February’17 Good progression but further derotation required on UL1 and some small derotations required for lower incisors. LL4 still needs to be uprighted. March’17 Further derotation still required on UL1. LL4 lingual cusp in conflict due to new position – patient advised to be careful when eating. Lower incisors still require derotation. Photos taken to post on forum. Impressions taken for new Archwize+ calculation and further aligners. 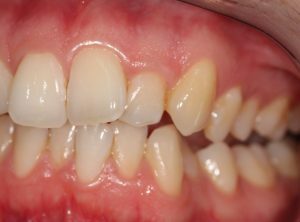 Patient due to have baby later this month so supplied with Essix retainers so that treatment could continue at a later date. May’17 Patient attended to fit upper and lower aligner 13. Upper a good fit but lower required chewies to fit properly. Attempted to apply composite anchors but these fractured three times in the upper right quadrant. June’17 IPR performed. Lower aligner 16 not seating fully on lower left quadrant. Patient given the last 3 aligners. July’17 LL4 showing considerable improvement in uprighting but occlusion between UL4 palatal and LL4 buccal cusp. Made patient aware of risk of TMJD’s. Patient happy with appearance but further aligners advised to upright LL4 further. Uppers aligned well but slight discrepancy in the central incisor edge position. 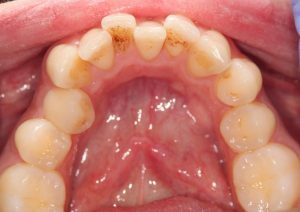 Gingival levels on incisors not quite equal. Recommended extrusion to level further to which the patient consented. Impressions and photographs taken. August’17 A further 6 upper and lower aligners required. Composite anchor placed on UL1. IPR performed as per Archwize. Patient given first 3 aligners. September’17 LL4 cusp still in conflict. 0.08 strip run between contact at UL1 and LL4 to make sure contact isn’t too tight. Aligner 4 from third box not quite seating so suggested chewies. 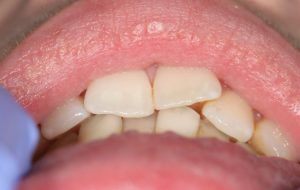 Spoke to patient about possible recontouring of lower incisors and occlusal equilibration. Full routine examination performed. October’17 UL1 has not moved to become level with UR1 but patient unconcerned. LL4 has uprighted so checked contact points and advised patient that bite will need to settle. Patient aware of LR1 sticking up so recontoured and patient happy. Took impressions for fixed and removable, upper and lower retainers, and sent to IAS laboratory but requested that they make essix retainers that cover to UR4 on right upper and lower to allow for posterior settling on the right and then make full coverage retainers once settled. 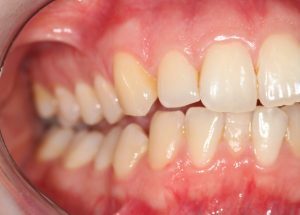 December’17 Checked fixed retainers. Checked occlusal contact points. Impressions taken for full coverage Essix retainers. Patient can’t return for several months as she is returning to work. Posted retainers to avoid ‘over settling’. December’17 Patient received Essix retainers. May’18 Retainers checked. 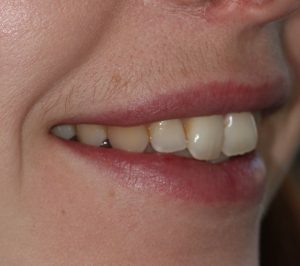 Photos taken and impressions taken for whitening trays. The support from the forum has been invaluable with my first case – especially posting the Archwize™ set up and getting this modified to obtain a better result aesthetically whilst also reducing the IPR required. 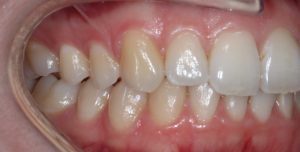 At the later stages of the case when I felt that the central incisors weren’t levelling and the aligners not seating properly, posting to the forum with photographs meant I was able to show the mentors exactly what was going on. It’s good to know that if there is something you are unsure of you can get good practical advice relatively quickly. Even if you aren’t having any problems, I would strongly recommend posting after every appointment just to receive feedback on case progression. There’s nothing nicer than positive feedback letting you know that the treatment you are providing is being performed well and that you are achieving good results. This was my first case and so I think I have achieved a satisfactory result. The treatment went on longer than I envisaged, but complications with the patient’s ability to attend for appointments and the hiatus due to her pregnancy lengthened the treatment time. Apart from the fitting of the first aligners, I didn’t have any problems with fit until the last 3 (aligners 4-6 in the 4th box). In hindsight, as aligner 4 didn’t seat properly I should have insisted on the patient’s return a week later to check on the fit. Then I could have raised the problem with the lab and gotten that last upper box remade rather than waiting until the box was completed and realising that the required movement of UL1 hadn’t occurred. I fully embrace the IAS ethos, and since the case detailed I have attended the IAS Photography & Record Taking course, the ClearSmile Brace trouble-shooting workshop and the IAS Ortho Restorative course. I still have a long way to go but I can see the progress I have made so far. Learning is a continuous process and I have no doubts that the treatments I provide and the results that I achieve for my patients will continue to improve. please visit www.iasortho.comor call 0208 916 2024. 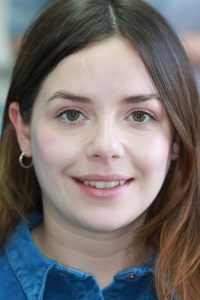 Dr Nina Proctor is a dental surgeon at Claypath Dental Practice in Claypath, Durham.